Have you ever wondered whether the commercial dog food you feed is really good for your dog? Have you considered making your own food but you don’t know what to put in it to ensure it’s balanced? Ever wanted to know whether you should vaccinate annually? Or wished you knew more about natural treatments for parasites and diseases? 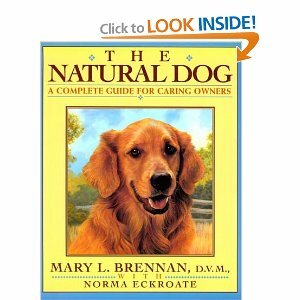 If you answered “yes” to any of these questions, you should read Dr. Mary L. Brennan’s book, The Natural Dog: A Complete Guide for Caring Owners. Dr. Brennan is a doctor of veterinary medicine who runs a holistic veterinary practice in Georgia specializing in small animals and horses. This book covers many topics of interest to dog owners, beginning with choosing a dog, behavior and training, grooming, a large section on diet which includes recipes for special diets you can make at home as well what ingredients are included in commercially prepared foods. There is a second section on natural veterinary care which includes information on acupuncture, aromatherapy, Bach flower remedies, chiropractic, herbs, homeopathy, magnetic therapy, and more. Part II of the book deals with common health problems such as arthritis, diarrhea, fleas and ticks, hip dysplasia, hypothyroidism, parasites, and skin problems to name but a few. Each problem is covered in depth and contains recommendations for natural treatment of the problem while taking into consideration the dog’s age, diet, exercise, and other health problems. The different treatment options are explained; for example, homeopathy can stimulate the body against specific diseases while acupuncture stimulates the body’s immune system and balances the body’s energy. What I like most about this book is the incredible variety of topics and how well the authors explained them. The Diet Section includes special diets ranging from losing weight to reducing allergies to vegetarian; there were even a couple of recipes for healthy treats. There also recommendations on commercially prepared foods that are good for your dog. Because I have two senior Greyhounds I was interested in the section on special considerations and requirements of the aging dog as well as alternatives to annual vaccinations. This book is definitely written for laymen who want to learn more about holistic care for their canine companions. It is clear and easy to read, and contains a wealth of information. I definitely recommend it to anyone who is interested in maintaining his or her Greyhound with more natural care.